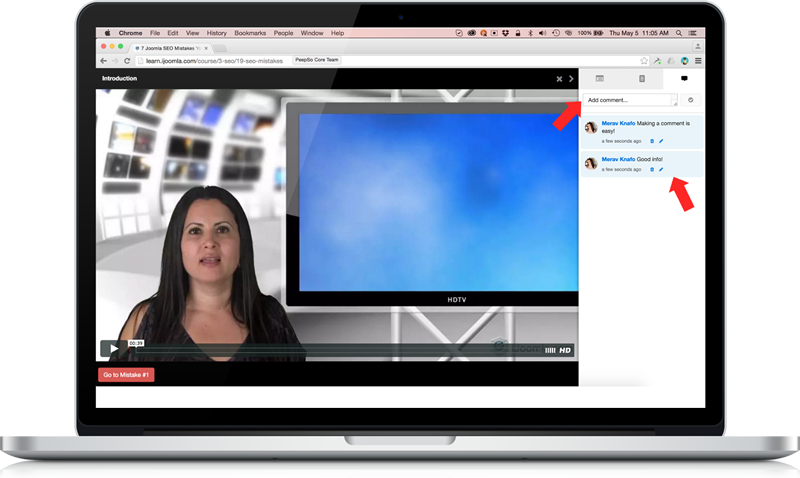 Students can now comment on lessons easily! The current commenting system is based on Kunena forum integration but we are also working on an independent commenting system. Students can also comment on lessons & ask questions on the forum. Kunena is a great forum extension for Joomla. We've been using it on iJoomla for a while and we love it. We knew it would make a great partner for Guru. Now you can automatically create Kunena boards for every one of your courses. Your teachers and students will be able chat freely about all your different topics, and students can even comment directly from inside the lesson page; the comments will be added to the forum's corresponding board. If you already have Kunena installed when you install this new version of Guru, the extension will ask you if you want to create forum boards for all your courses and lessons. All you have to do is click YES and they're yours. On the lesson page, users will see a comment box on which they can ask questions or place a comment. The comments will automatically be added to that lesson's board. Automatically create a forum board for every new course. Automatically create a forum board for every new lesson. Automatically add the teacher as course moderator. How to handle boards associated with deleted courses/lessons. On lesson Kunena tab you can generate a corresponding Kunena board. You can set up Guru so that teachers become forum board moderators when the extension connects the board and the course. Open the teacher's profile on the backend and you will see a new tab marked Kunena forum integration.The tab shows the courses teachers can currently moderate.